Anyone familiar with DK's Ultimate Sticker Collection range will know what to expect. 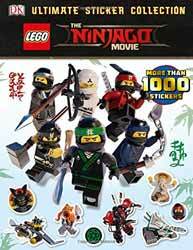 The format is pretty much identical to this year's (2017) LEGO The Batman Movie Ultimate Sticker Collection. The first section of the book contains facts and information and there are numerous silhouettes dotted around which hint at where some of the stickers can go. So there's the hunt and stick element for kids to engage in. Both the pages and stickers are glossy, good quality paper, meaning that if you're careful you should be able to move the stickers around until you're happy with them. While 1000 stickers sounds a lot (and it is) it's not 1000 different stickers. What you get are the main character and vehicle stickers, then pages of tiny square stickers (208 to each page) and then all of the stickers are duplicated again. It's a fun and engaging activity book for young fans of the movie.